Block or stamp or pattern for the batik block. 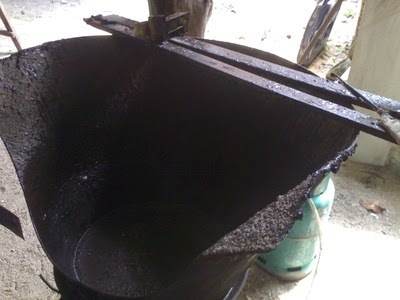 Molten wax of which the mold is dipped into before being stamp on cloth to make batik. Today, we are going to learn a bit on how batik block is made. 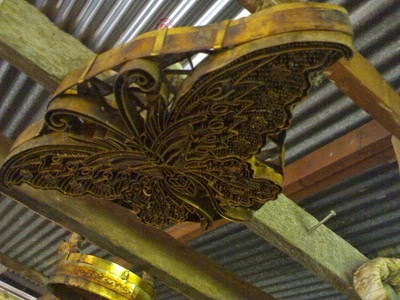 First, a pattern of design such as the beautiful one above there is crafted using copper. Then, it was dipped into hot liquid wax and using man strength, it will be stamped one by one on plain white cloths until all the surface are covered. Then, it would be dyed with the selected colours, either one colours or variety of colours. It would be left overnight and then be boiled to removed the access wax from the stamping process. 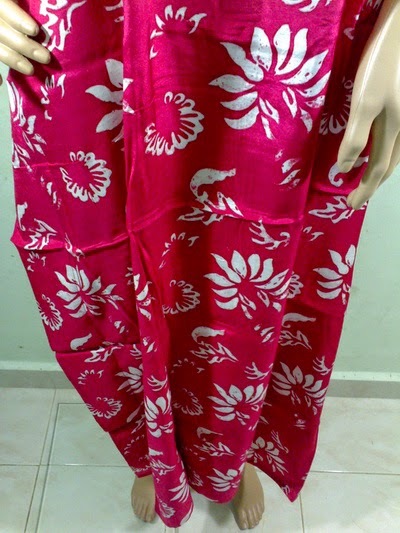 The end result would be the beautiful red batik kaftan such as the picture above. Similar technique is done also for batik sarong, batik clothing (usually for men's shirts) as well as batik bedspreads. This technique is slowly dying as there are much simpler printing technique around. What a shame. The copper stamps are definitely unique. The used one before would be melted and made into new design when it became worn. However, I have seen instances that it had been converted into deco items - put in frames to become art pieces which is definitely heaps better.